By way of simplified background information, African Bank Limited is a 100 percent owned subsidiary of African Bank Holdings Limited. The shareholders of African Bank Holdings Limited are the South African Reserve Bank (50%), the Government Employees Pension Fund (25% owned between its 1.2m active members, according to their website), and the other 25% owned by major South African banks. 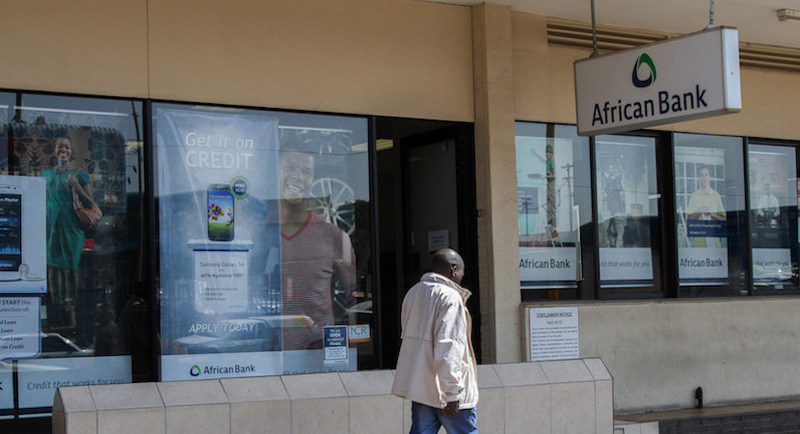 African Bank has made progress despite a “challenging and dynamic economic climate” which its board says points to the reality that SA Inc. (South Africa incorporated) needs to recover from 10 years of poor growth. In its results presentation African Bank says its customers are disproportionately impacted by higher fuel and food prices. If food and transport form a larger part of your personal basket, then a 14 percent higher unleaded fuel price in Gauteng (year to date) is likely to hit the ability to both borrow immediately, as well as servicing existing debt. For a hard-hit global customer, some relief is in prospect after an oil price that has softened significantly. The price of WTI (West Texas Intermediate) has fallen sharply from $67 a barrel four weeks ago to a little over $51. With a stronger Rand helping matters, it is likely that a lot of pain at the pump will ease in the coming months, helping to offset the interest rate hike. At face value the financial results point to more than just a steady success. 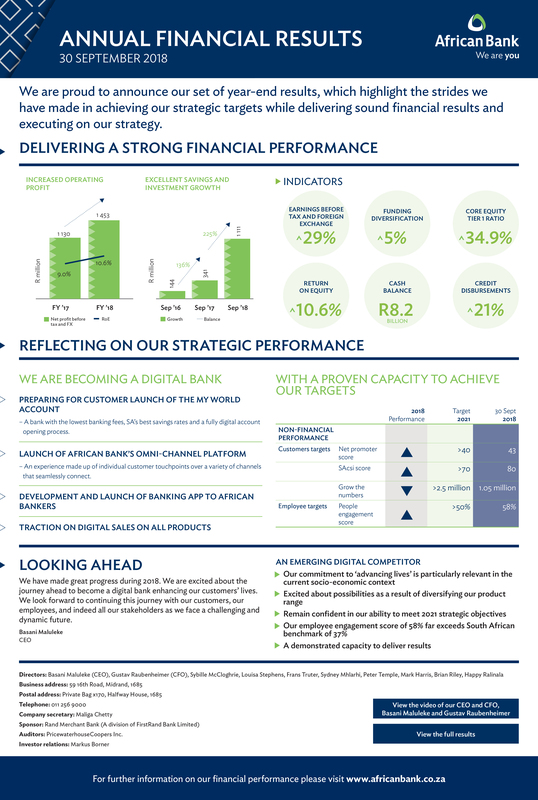 African Bank has reported a 29% increase in operating profits (to R1.4bn), a 225% rise in retail deposits (to R1.1bn), a credit loss ratio improving from 12.7% to 11.7%, as well as operational costs being flat year-on-year. The plans for the future look bold: the company has targeted 25% of total funding from retail deposits by 2021, from the current 5%, up from under 1% two years ago. Offering the country’s highest interest rates on fixed and notice deposits and a low fee structures, many consumers looking for higher returns are being attracted to African Bank. The current customer base is a little over one million. The African Bank plan to 2021 is targeting 2.5 million. Of all major strategy key points, this is the only one that has gone backwards, the customer base having shrunk by 200 000 in two years. What is encouraging, from a funding perspective, is that the average deposit size has grown to R72,000 from just over R28,000 two years ago. Notwithstanding the lower customer base, credit disbursements grew 21 percent to R9.6bn. The most notable, albeit relatively small contributors, have been a rise in the direct sales channels and a new web channel. Fewer branch visits means costs can be lowered over time, something reflected in the latest results. The overall advances book (total loans to customers) grew a modest 4% to R27.5bn, and is at roughly the same levels as 2016. What matters for African Bank is the ability to raise money at competitive rates and equally, lend out at competitive rates to their customers. The market for reliable and relatively cheap lenders is a competitive one, vying for a customer that is increasingly savvy. African Bank points out the credit quality of its customers receiving new disbursements is 88 percent low risk, according to scoring metrics. It is often better to have fewer customers that are of a lower risk. Read also: With spanking new, solid financial base, African Bank’s challenge shifts to rebuilding trust. Equally, rising smartphone penetration has meant that with the push for a better banking experience via an app based product may result in cheaper costs over time, with the ability to scale operations. South Africa’s smartphone penetration may seem low at 35.5%, that does compare very favourably to their African country peers. Egypt and Algeria are just under 30%, Uganda is in the mid-teens. A fully digital smart phone app MyWORLD bank account may be exceptionally well received by the public, time will tell. In the high road scenario, South Africa has an enormous amount of potential to save more at a personal level, outside of the forced savings pension pot. South Africa has a dreadfully poor personal savings rate. If you however, like I do, subscribe to the Hans Rosling measures of world income, rather than the traditional measures (developing and developed countries), and providing deep insight into our own personal stereotypes, read “Factfulness: Ten Reasons We’re Wrong About the World–and Why Things Are Better Than You Think”. There you will understand that credit can be life changing if used correctly, and access is all important in advancing humanity to better income levels. African Bank has “Advancing Lives” as one of their key pillars of purpose. In a low road scenario, with South African public finances struggling, country and enterprise cost of funding increasing due to negative sovereign perceptions (credit ratings) and inflationary pressures taking hold, retail depositors are likely to withdraw and access to credit may become harder and more demanding. The African Bank observation in its presentation that 2019 and 2020 will be challenging years for their lending business will no doubt be more impacted from all of the known risks, to paraphrase Donald Rumsfeld. Those are factors beyond their control, and quite frankly any businesses control in any operating environment. All African Bank management can control is their risk profile and their customer experience being a positive one. At face value, from these results and having worked hard to restore their brand, it seems like the business is on track.